SunSteel, LLC along with contractor Lease Crutcher Lewis joins forces to deliver the $22.5 million Meridian Center for Health in Seattle, Washington. The health center is expected to serve at least 14,000 people seeking medical, dental and behavioral care. Valley Cities and Public Health — Seattle & King County will also operate in the building. The 45,000-square-foot center was built less than 20 feet from the old clinic, creating challenges for construction, deliveries and staging. 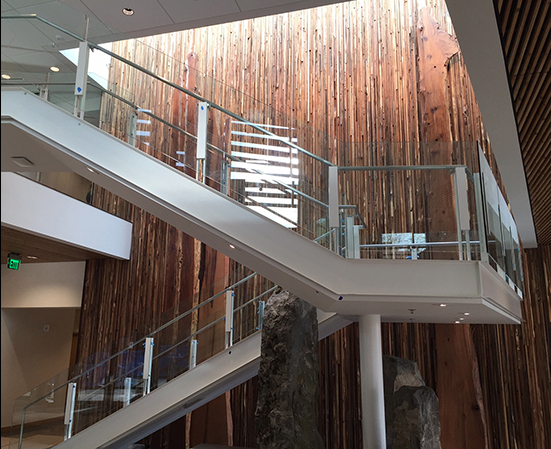 Inside, a “Healing Wall” was made from thousands of strips of salvaged wood assembled in the background with slabs of western red cedar in front. Neighborcare Health cares for more than 55,000 low-income patients in 26 clinics throughout Seattle. SunSteel fabricated and delivered this project into a very tight jobsite and was responsible for all of the miscellaneous metals, stairs and deck for the project.